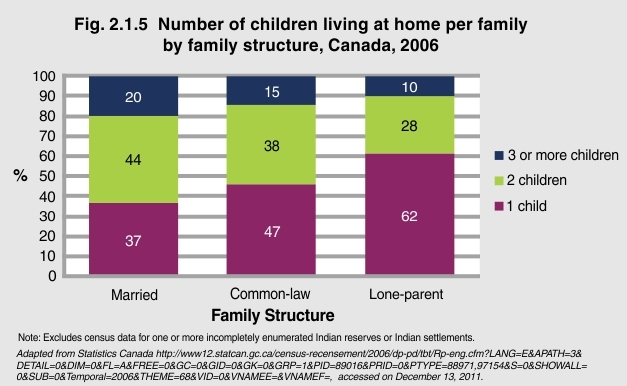 In 2006, the majority of married and common-law families with children had 2 or more children living in their household (64% and 53%), while the majority of lone-parents had only one child living in their household (62%). In Canada, the average family size declined from 3.7 in 1971 to 3.0 in 20061. There are many factors influencing the size of a family. Economic security, age of parents, marriage and divorce, educational attainment and participation in the labour force are some of the factors driving the trend toward smaller families in Canada. 1Statistics Canada accessed at http://www40.statcan.ca/l01/cst01/famil40-eng.htm on December 13, 2011.